I’ve never been a fast climber and am much stronger on flat terrain in both skiing and other sports (like biking). This year I competed in both the Birkie and the West Yellowstone Rendezvous 50km skate races (starting in wave 1 of both races). I paced myself well in both races, but in the last 10 k of both races, my muscles burned on the climbs and generally left me exhausted. I had no problems with muscle fatigue on the flat sections or any short hills requiring burst of power in the later portions of these races. I’m wondering how I can adjust my training to generally improve my climbing ability, and in particular to stave off muscle fatigue on hills later in a marathon. I’d approach it on three fronts, technique, strategy/pacing, training. Technique, when you come to the uphill, stand up taller to help get your hips forward over your feet. This will make it easier to take smaller skate steps, moving more quickly from foot to foot. This keeps the skis moving. You won’t get bogged down as easily, and will be able to keep the skis gliding with less effort. Also standing up with your upper-body helps you breathe more easily. Strategy / Pacing, this has to do when and where in the hill you put your energy. Focus putting energy where you get the most speed in return. Use your energy to maintain your momentum as far up the hill as possible, but then back off in the meat of the hill. Stand up taller, breathe and settle in to a relaxed rhythm. Then a few strides from the top, over the top and a few strides down the other side put in a bit more energy to build momentum through the transition and into the next piece of terrain. Training, lastly and probably most importantly, put these tactics into practice. Training with focus helps improve those things, but also helps you be in the zone while you are training – more focus on what you are doing, more improvement and a deeper enjoyment. Also, working on the hills with a specific focus will help you both physically and mentally to take them on. The VeloNews Fast Talk podcast is your source for the best advice and most interesting insight on what it takes to become a better cyclist. For decades (almost a century, in fact), we’ve been told that cramping is caused by electrolyte imbalance or bad hydration. But new science suggests that this probably isn’t why you cramp during exercise. So why do you cramp? It all comes down to something called altered neuromuscular control. A: Cramping most often comes from muscle fatigue. Your muscles need to get used to the 2,3,4 hours of marathon skiing. I do not know how much you train now or what your long days are and if you do intervals, etc. But the only way to hope to avoid cramping in next year’s Birkie is to replicate your Birkie effort in training leading up to the Birkie, to train your body for that effort. You need to get some long days in skiing replicating the efforts that you will be racing the Birkie. Up hills, down hills and balancing on one ski over uneven terrain and in sloppy Birkie snow. I think the unusual nature of the Birkie with the often sloppy snow and the stop and go nature of maneuvering around other skiers adds additional strain on your muscles. So you should try and replicate that effort. If you do not already do it, you should start rollerskiing in the summer, and increase your long days come fall. In winter do one long distance day a week and increase that throughout the winter. 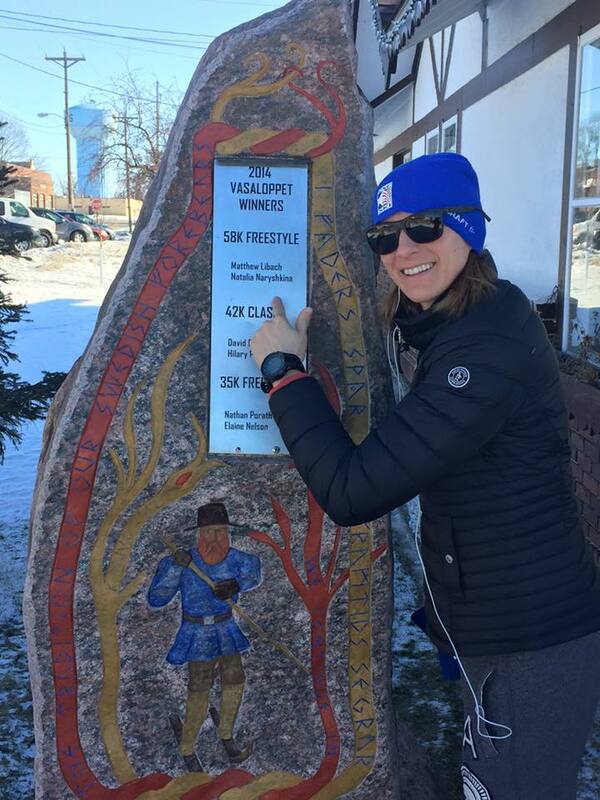 Race other ski marathons before the Birkie and then peak at the Birkie. There are no secrets. It just takes time. The difference in a ski marathon to a triathlon or a running marathon is the unpredictability of the snow condition. On a bad/sloppy snow day it takes a lot more muscle work to remain balanced. That, plus skiing in a huge crowd wears on you. And this is why I believe you may be cramping at the Birkie but not at a triathlon. So work on technique so you can ski more relaxed. Skiing faster, easier can be done with fitness and also with technique. Many people focus on fitness not enough people focus on technique. So learn how to glide father faster.